Parsons was dismissed by an official at the end of the match against the North Carolina Courage last weekend. He was fined and suspended an additional game for "Major Game Misconduct." 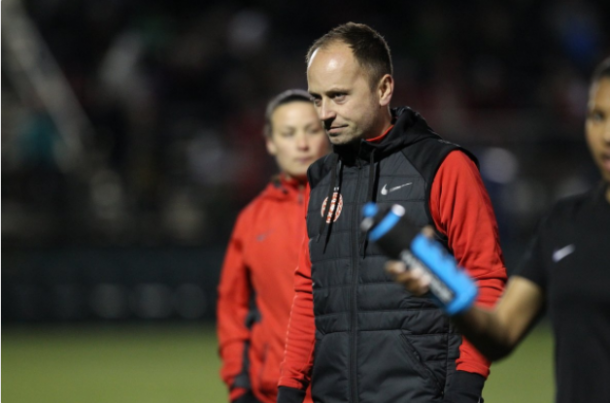 Pending appeal, the Portland Thorns FC will be without head coach Mark Parsons for two games. Parsons was issued a two games suspension and a fine for "Major Game Misconduct" and "Coach/Staff Misbehavior." He had apparently been sent off by an official during the match against the North Carolina Courage in Cary, NC on opening weekend. The exact timing of the incident is currently unknown, but near the 90-minute mark in the game, Parsons can be seen yelling at players and the head office near the midfield line. He is later shown back in the coach's box, so if he was dismissed for that incident it wasn't administered until the end of the game. The coach was upset by a no-call near the penalty area, but the decision in question was not widely regarded to be a missed call. According to the National Women's Soccer League rules, Parsons would be suspended one game for being dismissed by the official and will serve a second game and pay a fine as additional punishment. The Thorns are currently appealing the decision, but if it is not overturned then Parsons will miss the Saturday, March 31 match in Chicago against the Chicago Red Stars and the Sunday, April 15 home opening match against the Utah Royals FC at Providence Park. His first match back would be Friday, April 20 when Portland hosts the Washington Spirit. Losing their head coach would exacerbate the depleted roster situation that the Thorns currently face. The Thorns will be missing Tobin Heath, Caitlin Foord and Emily Menges in the upcoming match due to injuries, Meg Morris will be out due to illness, and Andressinha, Ellie Carpenter and Hayley Raso will all be away on international duty. The Thorns had just four field-player substitutes for their match against the Courage.